SkyRoll.com has gotten a lot of positive press and we know why! It could be because SkyRoll founder and air traveler Don Chernoff was telling his tell of a previous life making computer chips for Intel. It could be because Chernoff studied materials engineering and this was not at all helpful for his luggage company empire. 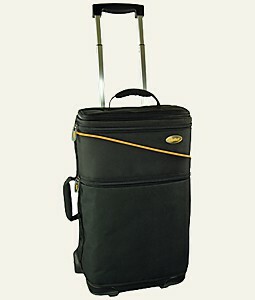 Or, it could be because Chernoff has set has set the standard for all luggage pieces, everywhere. We are privileged to have tried out SkyRoll's newest product, The Spinner. This is a high-end product in quality and usefulness. It is slightly heavy, due to its well-organized and substantive compartmental capacity. We rolled the entire piece out on a bed, separated the layout piece from the bag and it's longer than its male counter-part, so that our dresses will fit. All of the zippers are nicely situated, zip and unzip easily and very accessible. The next thing that we did was to completely unzip the back portion. This is where your dresses and dress pants would go. On top of that are the zipper pockets. One is smaller than the others (underthings and socks) and the bigger one is perfect for nightwear. There are 3 main compartments to this piece. This includes the longest side (which detaches), the top portion, where the toiletries (and the free toiletries bag are) go and the side opposite of the handle (this is lined with a softer material). This is perfect for roll-up shirts and socks. 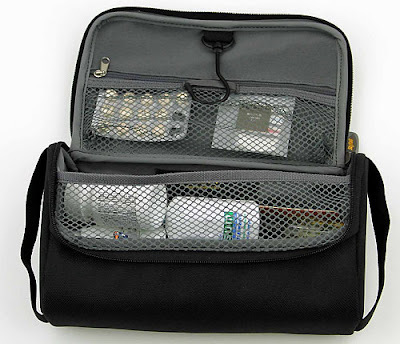 There is one smaller compartment on top of this door, which is perfect for your medicines, maps or small, electronic compartments. Overall, this is an excellent piece. Anyone would be proud to sport this thing as they stroll through the airport, pulling their unwrinkled things behind them. You might even do a little dance of joy if you think that none are looking. But, they might be. It's an attractive bag.